The Sun Hotel is an iconic part of the Townsville pub culture, renowned for its icy cold drinks, delicious food, fantastic customer service and inviting atmosphere . The Sun Hotel is the ideal place to bring your family with our Kids Room and the best quality meals at the best prices in town OR, to bring your mates down for an icy cold one after work with all of the LIVE sports on our 24 flat screens and the best TAB facilities around. Add to all of that our relaxing Lounge Area and it's impossible to go past The Sun. 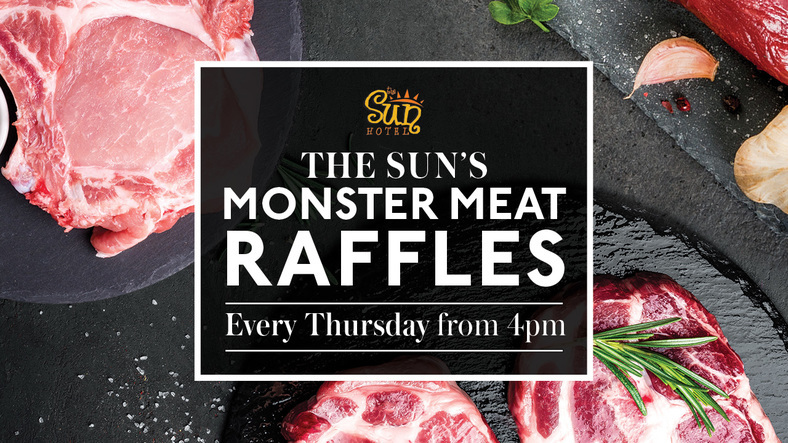 Join us every Thursday at 4pm for a chance to win a MONSTER meat tray. Pick the Joker to win the jackpot. Jackpots $100 every week. $50 cash drawn every 15mins between 6pm and 8pm. $400 given away every Friday. 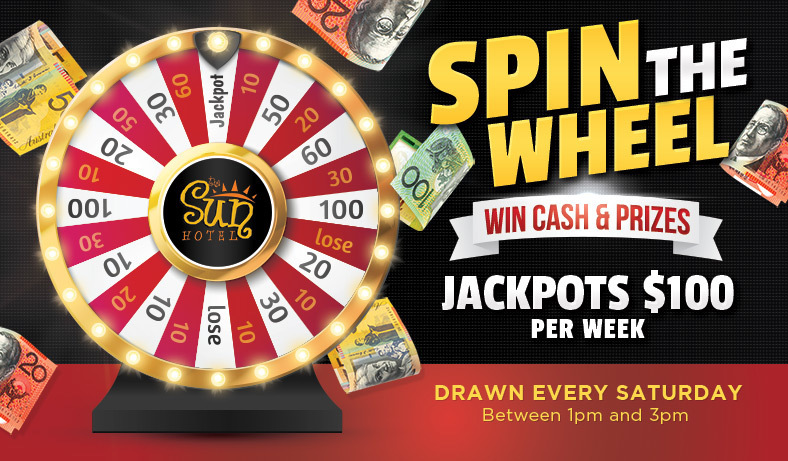 Spin The Wheel Prize Promo. The Sun Hotel bistro is open for lunch and dinner 7 days a week. Come and enjoy our laid back family friendly atmosphere. Parents can relax while the kids enjoy fun and games in our Childrens Room. The Sun Hotel Bistro is the ideal location for a quick (or long) business lunch or simply a leisurely meal with friends or family. Do you want the ideal place to meet your friends or colleagues seven days a week? If you are looking for a venue that has an inviting and friendly atmosphere, great customer service and guaranteed icy cold beverages - Then the Sun Hotel has got you covered. If you're the sporting enthusiast we have the latest contemporary TAB in Townsville showing both SKY Channels on Large screens. We also boast 24 plasmas dedicated to all 4 Fox Sporting Channels and any other LIVE game being broadcast - you won't miss a game at the Sun. 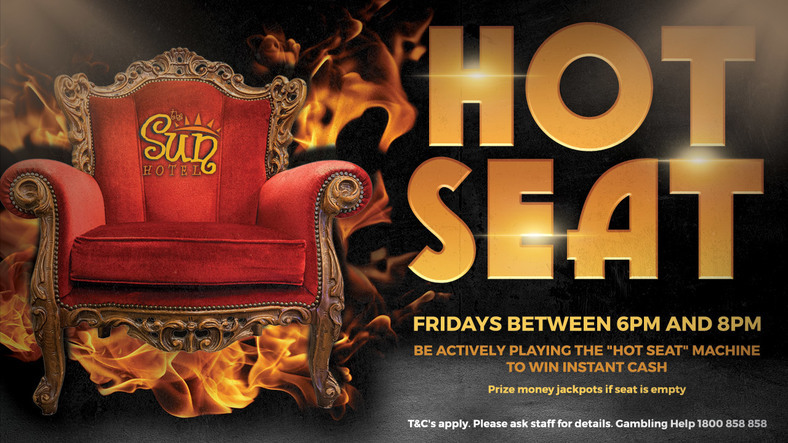 Our two TAB terminals aided by TAB Odds Touch Screens, Self Serve Terminals, Bet Busters and Free WiFi make everyone a winner at The Sun. If you prefer the numbers - Keno is also available in the Sports Bar and Gaming room with games able to be viewed throughout the hotel. Check out the Chill out zone - this is the ideal place to catch up with friends, meet your colleagues after work or meet the girls for cocktails. With subtle adjustable lighting, comfortable couches and a semi secluded area you can sit back and ponder the day's events whilst enjoying an icy cold beverage. Why not take advantage of the Hotel's FREE WiFi and conduct your business meetings here - simply call the hotel on 4779 5233 to reserve the area. Ask our friendly staff about booking this area for Private Functions! At The Sun Hotel, we value the importance of your function. We have a dedicated Events Manager who will help take the hassle out of organising your function and ensure your event is everything you desire! Our Liquorstax Drive-thru is open seven days a week from 10am to 12pm. The Sun Hotel has 45 machines boasting some of the latest games and a few old favourites. 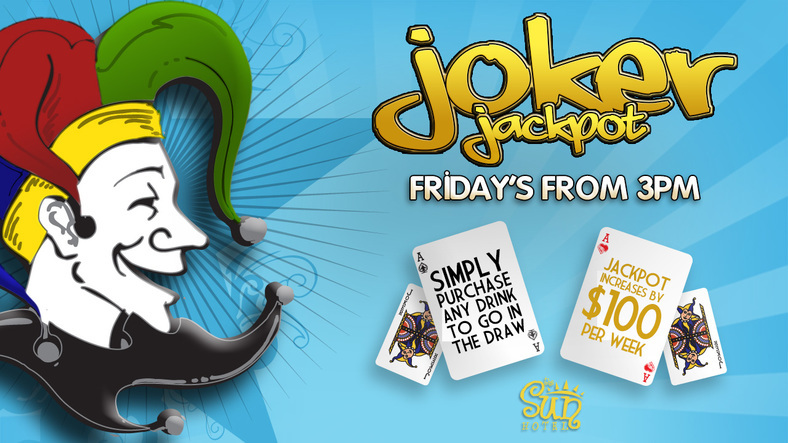 We currently have 2 linked Jackpots - Lightning and Jackpot Carnival as well as 30 stand alone progressive Jackpots. For your Keno enjoyment we have dedicated screens throughout our Hotel, as well as terminals in our Gaming Room and Sports Bar. Receive extra benefits by becoming a member in our loyalty program - this entitles you to bonus points and automatic entries in our regular Gaming promotions. A Current QLD RSA and RSG are essential.